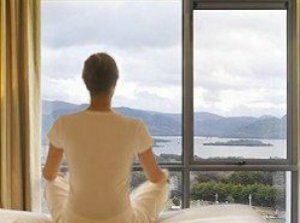 Allow us to welcome you to the unsurpassed luxury of The Spa at Aghadoe Heights and awaken your senses to Ireland’s premier spa resort, a sanctuary of peace and tranquillity. This hideaway having won numerous accolades both in Ireland and Internationally is a unique experience. The team of intuitive award-winning therapists can advise on the perfect way to de-stress and re-charge mind and body. Let our experts guide you through a carefully selected Treatment menu from facials, massages, scrubs and wraps to holistic reflexology and treatment enhancements. 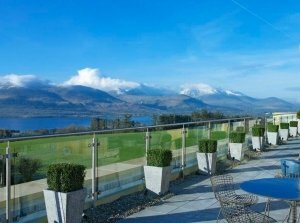 Resting on a hilltop overlooking the magnificent splendour of Lough Leane, Aghadoe is a special and spiritual place. The Spa at Aghadoe Heights has been designed to harness the power of this tranquillity and draws inspiration from the breath-taking beauty that surrounds it. 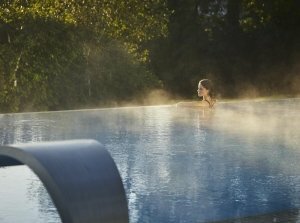 Using natural slate, cascading water and a palette of colour inspred by wild Irish flowers and grasses, The Spa at Aghadoe has created a refuge from everyday life, a space to rediscover yourself. An invigorating full body exfoliation with organic salt scrub will stimulate blood and lymph flow. Allow the grains to fall from your body before sinking into the warm waters of the hydrotherapy bath filled with wild hand-harvested seaweed. Natural oils are suspended in the water readily available for the body to absorb. Then enjoy a sensuous massage with organic body cream leaving skin feeling smooth, glowing and flawless. senses with the burning of a VOYA scented candle. Deeply detoxifying and has an impact on cellulite and weight loss, soothes aches and pains and aids in the healing of psoriasis and eczema. A wonderful fun, yet relaxing experience most enjoyable when shared with a friend or loved one. Lashings of organic seaweed based mud is applied to the body. The serial chamber allows dry heat and steam to activate the healing effects of this mud combining the detoxifying elements of two world renowned seaweeds, Laminaria and Fucus. After an invigorating shower, return to your room, for a soothing application and gentle application of warm oils. Emerge feeling utterly relaxed, cleansed and chilled. The ultimate treat for tired and dull skin. This invigorating all-over body exfoliation refines skin texture and increases luster. Ground down seaweed combined with a melody of botanicals works to firm skin tone while removing dead skin cells helping to encourage cell regeneration and even skin tone. To finish, an all-over massage application of organic body cream is applied. Leave feeling awakened and re-energized with smooth silky polished skin. as rejuvenating tired eyes leaving you looking fresh, bright and youthful. Based on Ayurvedic Shirodhara, a warmed botanical concentrate, streams between your brows and flows gently off the back of your head. This process is extremely calming and is recommended after a massage or a facial treatment. This is a profound relaxing experience. The ultimate in foot massage. Using warmed oil and stones, it is firm enough not to tickle, but gentle enough to be sublimely relaxing and revitalizing. A rejuvenating and nurturing hand treatment that uses the healing touch and plant botanicals to improve the condition of the nails, cuticles and hands. A special exfoliating scrub using natural ground down walnut shell and soothing almond oil is combined with warmed Atlantic seaweed leaves to intensely nourish and smooth dried out hands. available. This total relaxation experience will rebalance the body, mind and spirit. Specific crystals, aromatherapy oils, light and sound therapies are chosen for your personal requirements and will re-align and uplift both body and soul. Your voyage starts with a footbath and a sensory journey to choose your personal singular note aroma. Then, enter the precious stone cabin where crystals are placed along the reflex points of the back in your seat. As you relax and meditate in the warmth of the cabin, light, aroma and sound therapy work together with the powerful effect of the precious stones to give you a truly amazing and beneficial all round experience. This detoxifying facial is suitable for all skin types, but of particular value for refreshing tired and listless skin. In this truly organic facial we use spiney bamboo to gently exfoliate and encourage cell renewal followed by a signature massage using a rich blend of organic oils which work to increase skin radiance and luster. Finally, a rich soothing gel mask is applied to thoroughly hydrate thirsty skin. This is all complemented with a relaxing scalp massage. and leave the complexion smooth and luminous. This treatment includes a hot foam back cleanse and soothing scalp massage. neck and décolleté. Includes a relaxing therapeutic scalp massage. This facial treatment is suitable for all skin types, but of particular benefit for alleviating fine lines and wrinkles. This purely indulgent facial begins with our signature foot ritual and then a back exfoliation and massage. Meanwhile you will find it almost impossible not to relax as our rich combination of marine botanicals and wild Atlantic seaweed, together with our deep cleansing balm, work to restore the natural minerals and oils to the face, neck and décolleté. Thoroughly unwind with a relaxing scalp massage. This unique facial treatment infuses tired and lack luster skin with all the goodness of the ocean together with some of the earth’s most powerful herbs. Using warmed poultices filled with hand-harvested, mineral-rich seaweed and organic Rosehip, Green Tea and Chamomile, this detoxifying treatment lifts and firms the face and neck leaving you with a youthful, energized glow inside and out. Seize the opportunity to release any built up tension with the help of our revitalizing eye treatment and stress relieving scalp and hair massage. firm, flawless and luminous complexion and noticeably revived eyes. skins natural defences. Our organic moisturiser locks in all the goodness, leaving you fresh faced and invigorated. Treat tired muscles to an invigorating massage journey incorporating deep muscle work, concentrated on specific tension areas and skin nourishment with VOYA’s organic body oil. Sink into a warm, detoxifying seaweed leaf bath. Allow your aches and pains to dissolve away and be replaced with the natural vitamins and minerals of our wild Atlantic seaweed. Next receive an invigorating back massage using the world’s first organic seaweed oil. application of our ‘softly does it’ moisturiser. massage. Your hands are then enveloped in warmed Atlantic seaweed leaves to hydrate, increase circulation and nourish dry and worn out hands. Hands feel silky soft and deeply nourished after the layering of rich organic hand cream. To re-charge circulation of the lower limbs and refine your skin enjoy our invigorating sea salt scrub followed by a deeply relaxing massage of the lower legs. Your legs are bound in warmed Atlantic Seaweed leaves and while the oils work their magic on dry feet and heels, we treat you to a tension-releasing scalp massage. Ideal for maintaining a recent manicure or for someone in a hurry. Includes nail shaping, cuticle maintenance and a polish of your choice. Soothe tired hands with our nourishing hand treatment. After cuticle minimising, hands are cocooned in a dual action seaweed mask to hydrate, increase circulation and condition dry skin. Organic hand cream is applied to seal in the goodness before nails are filed and polished. will leave feet looking and feeling brand new before nails are filed and polished. Ideal for foot ailments of all kinds. A specialised treatment of the feet. Reflexology can enhance the release of tension and stress while relaxing the entire body. Gentle pressure is applied to specific points on the feet to stimulate energy lines within the body encouraging your own natural healing system. It is beautifully relaxing, calming and beneficial to your entire system. to eliminate headaches and eye strain. You will finish the treatment feeling calmed, revitalized and with uplifted spirits. Indulge in this truly luxurious and totally organic top to toe holistic experience. This deeply nourishing and relaxing signature treatment will leave your mind and body completely relaxed and your skin, silky smooth and deeply hydrated. Your therapist will exfoliate and bathe your feet in a bowl filled with gleaming crystals, before a full body polish will invigorate and smooth the skin. Then a luxurious full body massage, combining the key holistic treatments of reflexology, Thai and Swedish massage, aromatherapy and crystal therapy, will take you on a magical journey that won’t be forgotten. lymph flow. The world’s first organic seaweed oil is then massaged deep into any stiff, tight or aching muscles followed by an aromatic organic body cream to seal in the essential oils. cream is then massaged into the body to lock in the essential oils. Choose from: organic chamomile, organic peppermint, organic fennel. combined with specific massage techniques will balance, soothe and invigorate your body and mind. Targeting the neck and shoulders this rejuvenating back massage will alleviate stress and deep muscle tension. The world’s first organic seaweed oil is massaged deep into muscles to relieve stress and tightness. Indulge in a soothing relaxing body massage personalised to meet the individuals needs. Advanced massage techniques combined with the use of hot towels will help relieve your aches and pains. without the nuisance of having to turn over. It is just pure uninterrupted relaxation. Hydrotherm changes your perception of massage. cushions cradle your body, easing the strain on your muscles. This massage is beneficial throughout pregnancy as it aids in the relief of low back discomfort, supports ligament changes, eases water retention, improves circulation and helps speed the healing process. This is the perfect way to relax after a tough day on the golf course. 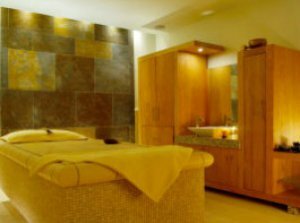 After unwinding in the thermal suite, enjoy a deep tissue massage. The world’s first organic seaweed oil targets specific muscle groups and helps to soothe any tension in the back and body. The massage warms and treats the muscles to give intense relaxation and relief to the aches and pains associated with over strain and tiredness. based concentrate is directed in a continuous stream onto your “third eye” which is known as “Shirodara”. Rich elements of the surrounding land and sea are combined in this exclusive VOYA ritual. Step into a cocoon of relaxation and commence your journey with an initial touch to awaken your senses. An all over body exfoliation will then help to renew and refresh the body, leaving your skin silky soft. Next, drift away as we envelop you in our warm spiced mud wrap, complete with pressure point scalp massage, integrating the skin rejuvenating properties of Kerry peat and the detoxifying, hydrating properties of Irish seaweed, infused with the essence of ginger and mandarin. 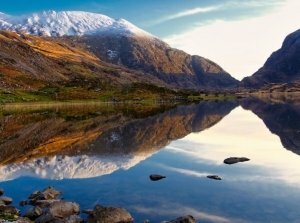 Complete your journey with a muscle relaxing massage using an oil infused with a light and fresh combination of elements from Killarney National Park and an application of the softly does it body moisturiser. All prices listed are per person unless stated otherwise. To fight the signs of aging and reduce the appearance of fine lines and wrinkles, enjoy a lifting, plumping and firming facial. Leaves of wild Atlantic seaweed are placed over a richly blended oxygenating face mask while you enjoy a therapeutic scalp massage. This facial is followed by a rejuvenating seaweed wrap designed to detox and firm the body’s contours. 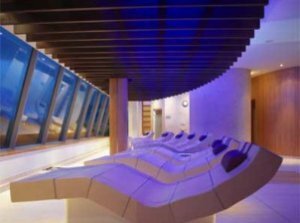 Start your day in the thermal suite where the wet and dry cabins will start to detox and rejuvenate your body. A deep tissue massage will continue to breakdown toxins. This is followed by a VOYA marine leaf envelopment wrap. While the inches are melting away enjoy an exquisite relaxing scalp massage. Ideal for someone who has travelled a long distance or simply to give you that change of season boost. Begin with time in our thermal suite with surging tropical aroma showers and enjoy dry and wet heated chambers. Have your skin regenerated and conditioned with a therapeutic sea salt exfoliation. Next submerge in your very own Hydrotherapy bath filled with wild hand harvested seaweed. Natural oils are suspended in the water ready for your skin to absorb. The experience finishes with an application of VOYA’s organic body cream and a targeting back massage to break down toxins leaving you feeling renewed while providing intense relaxation. Begin your day by relaxing in the warmth of the Thermal Suite. The real pampering then commences with an intimate body scrub followed by a detoxifying facial designed to lift, firm and tighten tired and weary skin around the face, neck and décolleté or seize the opportunity to release any stress or tension with a deep tissue back massage targeted to soothe muscular tension and tightness in the shoulders. Enjoy this treatment side by side with your partner, Followed by a two course lunch in the Heights Lounge. For the ladies that “Lunch”! Your day of pampering and spoiling begins in the warmth of the Thermal Suite. 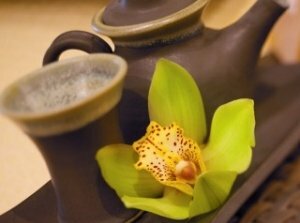 Be transported into another world, relax and let all the stresses and strains of daily life dissolve as we perform an energy-boosting facial or massage that will leave you fresh and glowing. Feel utterly pampered as we firstly exfoliate and then massage hands leaving them silky soft, ready to be filed and polished. There’s a brand new little person on the way and busy times ahead, so now is the time to treat you and your little one to some “you and me” time. Firstly you will enjoy a massage on warm water-filled cushions cradle your body, easing the strain on your muscles. This massage is beneficial throughout pregnancy as it aids in the relief of low back discomfort, eases water retention and improves circulation. Next, treat yourself to a VOYA facial created specifically with you and baby in mind. Finally, enjoy the pleasure of an experienced stylist to transform your hair with a wash and blow dry while you relax and appreciate the joy of pregnancy and leave the stresses of life behind you. The perfect escape after a stressful week. 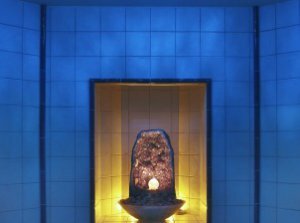 Begin with some relaxation time in the Thermal Suite and pool before enjoying one of VOYA’s invigorating seaweed scrubs to breathe energy and life into tired and weary muscles. Next allow the stresses and strains of modern life to float away as you enjoy a detoxifying bath filled with wild Atlantic seaweed. To top it off, a warm oil full body massage is performed to cleanse and soothe the skin. After a snooze in our relaxation suite, enjoy lunch in the Heights Lounge. Please contact the spa for details. Inspired by the sea this body wrap draws on the detoxifying and natural anti-aging properties of Laminaria seaweed combined with stimulating body brushing, to deeply nourish and relax tired and lethargic muscles. To ensure full absorption, the body is wrapped securely in muslin whilst you receive a heavenly scalp massage allowing any strains or stresses to drift away. fresh, revitalized and ready for whatever life throws you. Enjoy the benefits of detoxifying seaweed and purifying peat combined with a luxurious blend of ginger, aloe and orange peel in this warm spiced mud wrap. Our warm blend of herbs work together to firm and tone the skin while cocooning the body in nature’s balm. Finally the body is enriched with a generous application of organic body cream to lock in the vitamins and minerals. organic muslin cloth to lock in all the oils and cocoon the body. While your skin absorbs the natural oils, a scalp massage is performed to relax and clear the mind. To finish, an application of organic body cream seals in the goodness. 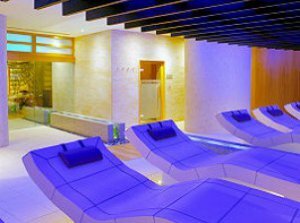 "We went to The Spa in the Aghadoe Heights with a group of girlfriends to celebrate a 30th Birthday. We actually stayed over as we decided to make a night of it. We checked into the hotel at 11.00am and went straight to the Spa. The therapists were amazing and the treatments were just out of this world. The Aveda products were unbelievable and the smell from the creams etc was amazing and you got to choose your own oils to customise your treatment. 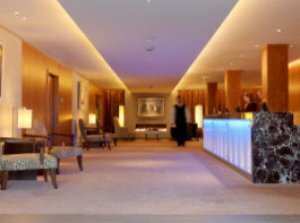 The Aghadoe Spa staff were the best I have ever dealt with and nothing was a problem. The staff even surprised us with a glass of Champagne & fruit kebabs in the relaxation area to celebrate my friends 30th Birthday. I would highly recommend the Aghadoe Spa for the best treatments and customer service. " "I have had many massages but never a massage like i got from therapist aine it was absolutly amazing, I felt like a totally different person after it." 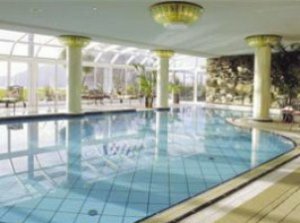 I highly would recommned a vist to the Spa in the Aghadoe Heights." 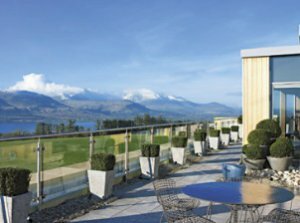 Buy Gift Vouchers for Aghadoe Heights Hotel & Spa and other top spas across Ireland.